We had a fun family movie night courtesy of Movies Anywhere watching Minions over the Halloween weekend. It is always enjoyable to pop up some popcorn, relax on the couch with my minions and watch a move that the whole family appreciates viewing. Minions, the prequel film that leads up to the Despicable Me series of movies, is a delight to see because of the zany antics of those wacky yellow creatures that star in it who mean well but have a tendency to be really unlucky. Of course the minions' bad luck leads to lots of humorous situations that have my family smiling and laughing throughout the movie. 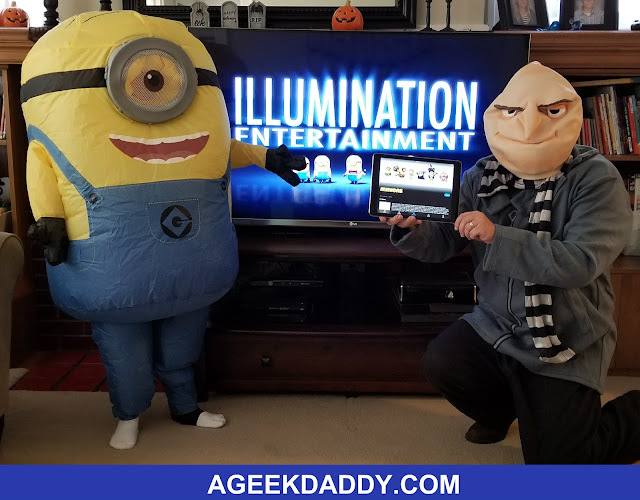 Movies Anywhere provided us a digital download code for Minions and we streamed the movie in high definition to our big screen television. Using this digital service is very easy and it makes accessing and storing your home video library very convenient. Originally known as Disney Movies Anywhere, the service has a new name and now provides a one stop spot for people to view digital movies from Fox, Sony, Universal, Warner Bros, as well as Disney. With the Movies Anywhere app and website you can download or stream movies to watch virtually anywhere. Stream a movie to your television like we did for our family movie night or download a film to watch on your mobile device while you are on the go. Movies Anywhere simplifies your digital video collection by providing access in one place to movies from multiple studios purchased or redeemed through a variety of retailers. Redeem digital copy codes found in eligible Blu-ray and DVD disc packages from participating studios and enjoy them through Movies Anywhere whenever and wherever you want. Link your account with Amazon Video, Google Play, iTunes or Vudu and when you make a movie purchase it will instantly be available to view through Movies Anywhere. No more having to worry about a device being compatible with the retailer you purchased a digital movie from. It was despicable to me that you used to be locked into watching movies on certain devices based on where you bought them. Movies Anywhere bridges the gaps between retailers and hardware manufacturers giving consumers control of how they watch the movies they purchase. Buy a participating studio's movie from retailers including Amazon Video, iTunes, or Google Play and through Movies Anywhere it can be viewed as you desire on your choice of Amazon Fire, Android devices, Apple TV, Chromecast, iPhones, iPads, Roku and popular Internet browsers no matter where you bought it from. If you want digital movies can even be purchased straight from Movies Anywhere. There are more than 7,300 films available through Movies Anywhere and that count will continue to grow as new releases come out. Another nice feature about Movies Anywhere is when mom or dad want to watch a movie that is too scary for the kids or isn't age appropriate for them it can be streamed or downloaded to a device so it can be watched in private. In fact, Movies Anywhere accounts are designed knowing families have multiple members with differing preferences. So you can stream multiple movies simultaneously to different devices using one account. So on a night when we weren't watching something together, I was able to download and watch Kong: Skull Island to watch on my iPad in our home office while the kids streamed The Emoji Movie on the living room television from the same Movies Anywhere account. One of the ways we like to make a family movie night fun is by getting into character ourselves. We had a blast dressing up as Gru and his minions with outfits from Costume Super Center. Costumesupercenter.com always has a great selection based upon movie costumes in sizes for both kids and adults to choose from. Looking for a Santa suit for a Christmas party, a Jedi robe to go see Star Wars Episode VII in, or some Minions inspired outfits for your own family movie night party, Costume Super Center has a great selection to choose from that will add some extra fun to any occasion. A Geek Daddy's minions give Costume Super Center a thumbs up! Haha, I just love your costume! So fun. I'll have to check this out. We do enjoy having family movie nights. I love how you all got into character while enjoying movie night. Minions is a favorite at our house and we need to plan a family movie night soon. I bet my dad would love to have access to Movies Anywhere. It's nice that it offers multiple accounts so we can simultaneously stream our preferred movies in multiple rooms at home. I love how creative you are there. Dressing up for the movie would be fun for me too. You all look like a fun family to hang out with! Of my son-in-law had a outfit like this he would totally wear it and watch the movies with the kids. How fun a dad are you. My kids would love dressing up to watch a movie. I love the costumes so much. What a great movie night! Movies Anywhere seems like an awesome service for having movie nights as often as you want. Oh my goodness your minions movie night is amazing! I totally wish I had been there myself! The new D3 movie was fun! We have been using Movies Anywhere and we love it. Minions are our favorite. We are planning on having a movie day this weekend. We are expecting rain all weekend so movies are the perfect activity. I love the Minions costume. That is too funny and perfect for a Minions movie night with MoviesAnywhere. What a fun Minions movie night! My family does not watch enough movies together. Thank you for this reminder. I love your costumes! My kids absolutely love the minions and loved seeing Despicable Me 3 in theaters...can't wait until it is out on DVD! I do love a good family movie night, I just really enjoy the time together. 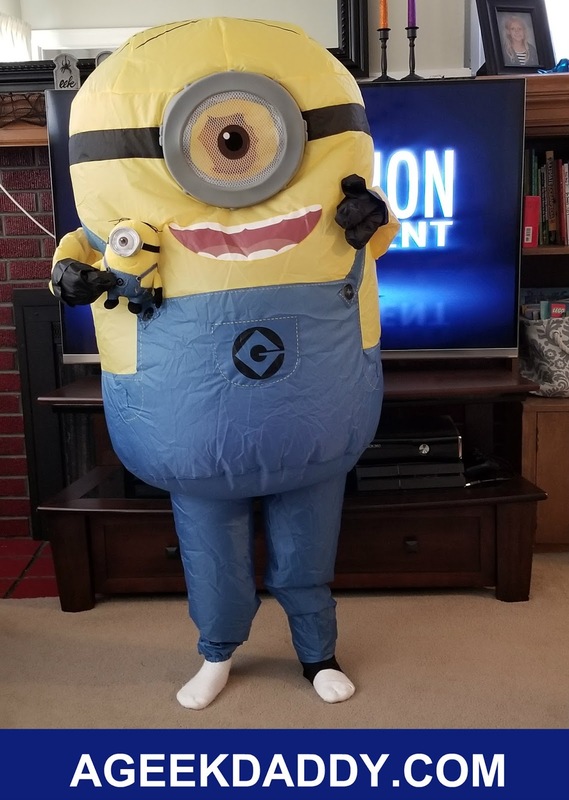 My nephew loves minions and would have enjoyed this movie night. How fun that you guys dressed up. This is something that my husband and I haven't done yet. Family movie nights are always a good time. I haven't heard of this Movies Anywhere app so I will have to check it out. Best mask ever!! 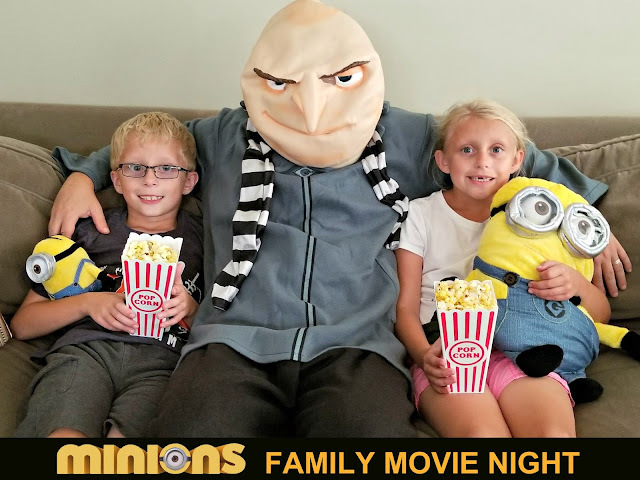 We love the minions movies, and having family movie nights is the best! 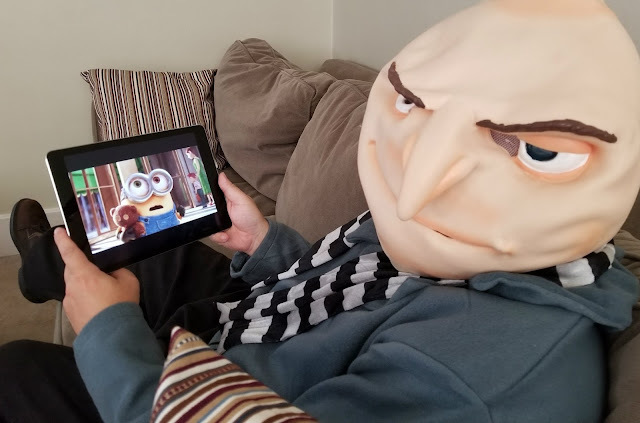 I love your Gru costume, too funny! I have heard great things about Movies Anywhere, I really need to check into them. I love the costume. I teach English to kids in China and they adore my minions that I use as props. Super cool. These pictures are too cute! It looks like such a fun family night :) I love movie nights, they are the best! Always something to look forward to, too! This literally made me laugh out loud. My daughter would flip if we had those costumes. She is a total Minions Fan! The Despicable Me series is one of our favorites. Dressing up for movie night is a fun idea. Your family has so much fun! Love the costumes!